With luxurious bonuses that cater for high-rollers, Boyle Casino certainly has the charm of the Irish about it. 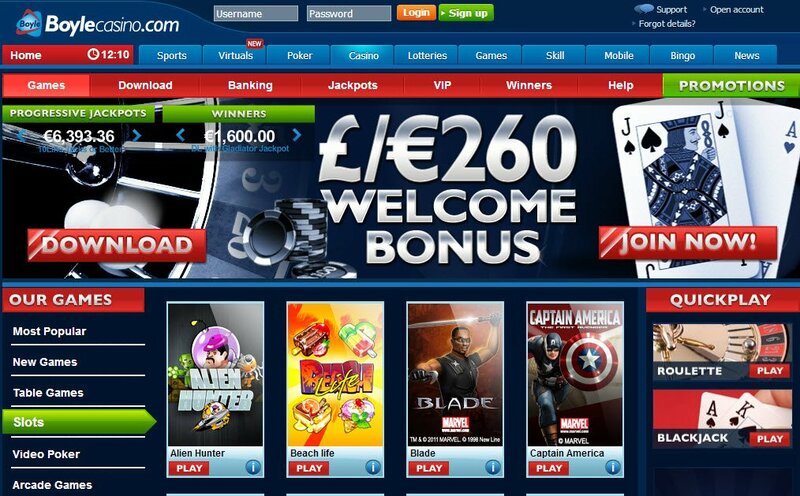 Coupled with spectacular customer service and some of the best software run games available, the only thing missing when you play this casino is an Irish accent to accompany you every step of the winning way. Boyle Sports is said to be Ireland's most successful independent bookmaker and, it was established back in 1989 by Mr John Boyle himself. In 2001 they took over 15 William Hill shops and, to date, they boast sponsorship of many notorious sporting events across the UK. The Boyle Casino is licensed in Alderney by the AGCC and was established in 2007. With such a wealth of gambling experience behind them, will their online and mobile casino live up to the luck of the Irish? 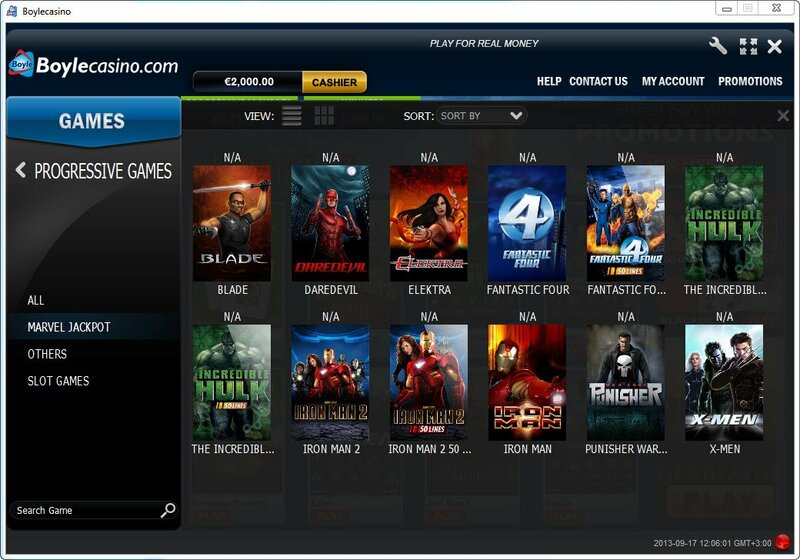 Running on Playtech software, we can see that Boyles Casino has done its homework and chosen one of the industry frontrunners in online casino software. 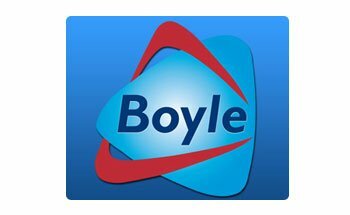 Now comes the age old question - play in your browser or download Boyle Casino? With an incentive to players who like to take some extra time off the bat when playing a new casino, those who download will have over 50 extra games to choose from and, quicker game loading times. A nifty feature of using Playtech software is the amount of fabulous Boyle Casino progressive jackpot slots on offer. The Boyle Casino welcome bonus will match your first deposit up to £100. On your second deposit, you'll get 50% matched, up to £50 and, for your hat trick of welcome bonuses, Boyle Casino will match you penny for penny up to £110. For the slot lovers amongst us, there's a special 200% slot bonus of up to £150 and, there's also the option to get 20% back on the slots if you have a losing streak week. With a daily deposit bonus of 20% though, you should be right to keep on rolling. If you're a high-rolling Boyle Casino player, and you deposit £1000 or more, you'll enjoy a luxury £500 bonus. With a fair range of Boyle Casino payment methods on offer, you are sure not to be stuck for a way to deposit and gain the sparklingly charming Irish led promotions available. Withdrawing your winnings from your welcome and slots bonus is subject to the same wagering requirements as most fair play online casinos so, you'll be well on your way to withdrawing your winnings to the same large selection of payment methods. Live Chat was answered almost instantaneously and VIP James was polite, professional and, certainly had the charm of the Irish about him. This shows that that extra couple of seconds you are required to spend choosing what topic you have a query on pays off as, you will get through to someone easily equipped to help you with your chosen quibble or question. The ringing to let you know you have received a reply is especially useful for those of us who may sometimes get distracted, doing a zillion things at once on the computer! I was promised an email by the end of play the very same day to answer a question that James couldn't and, to my delight, I actually received it! I read something about Casino Ace, what exactly is this and how is it connected to Boyle Casino? Hi, thank you so much for your question. Casino Ace is Boyle Casinos loyalty program. Casino Ace allows players the opportunity to win weekly cash bonuses. You simply need to collect points by playing your favorite games, the more points you collect, the higher the cash bonuses you will receive. I hope that answers your question. I like Playtech games and I have no complaints about Boyle in terms of its game offerings. I also find its site to be user-friendly and it’s a convenient and comfortable experience. What I do find disappointing are its promotions. Even though I’ve signed up to receive them I never get them in my email and I can’t access all of the promos they offer, which I find frustrating.